2018 Kawasaki Ninja ZX-10R. Picture credits - Kawasaki. Submit more pictures. No other supersport can claim the World Superbike Championship like the Ninja� ZX�-10R. The Ninja ZX-10R propelled Kawasaki rider, Tom Sykes, to overall championship podium finishes every year since 2012�securing a championship title in 2013�and delivered back-to-back championships for 2015 and 2016, this time with Jonathan Rea aboard. Comments: 154,4 kW (210 PS) at 13.000 with RAM air. Small windscreen. Kawasaki Launch Control Mode (KLCM), Kawasaki Intelligent anti-lock Brake System (KIBS), Kawasaki Sport Traction Control (S-KTRC), Kawasaki Engine Braking Control, Kawasaki Quick Shifter (KQS) (upshift only), Kawasaki Corner Management Function (KCMF). 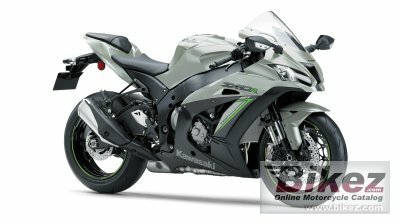 Ask questions Join the 18 Kawasaki Ninja ZX-10R discussion group or the general Kawasaki discussion group. Bikez has discussion forums for every bike. View comments, questions and answers at the 2018 Kawasaki Ninja ZX-10R discussion group. You can sign up for e-mail notifications when other riders answer you. If you have extensive experience with the MC, please send us a review. If you consider buying this bike, you should view the list of related motorbikes Look at photos. Compare technical specs. And check out the rating of the bike's engine performance, reliability, repair costs, etc. You can compare the rating with other bikes.